Please click here to take the *1 minute* survey so I can make it better! Imagine a modular synth with 10s of modules that could be instantly wired up at random. Imagine then being able to combine or breed different circuits, or to create multiple variations of a circuit with subtle wiring changes. That's basically what evosynth does. 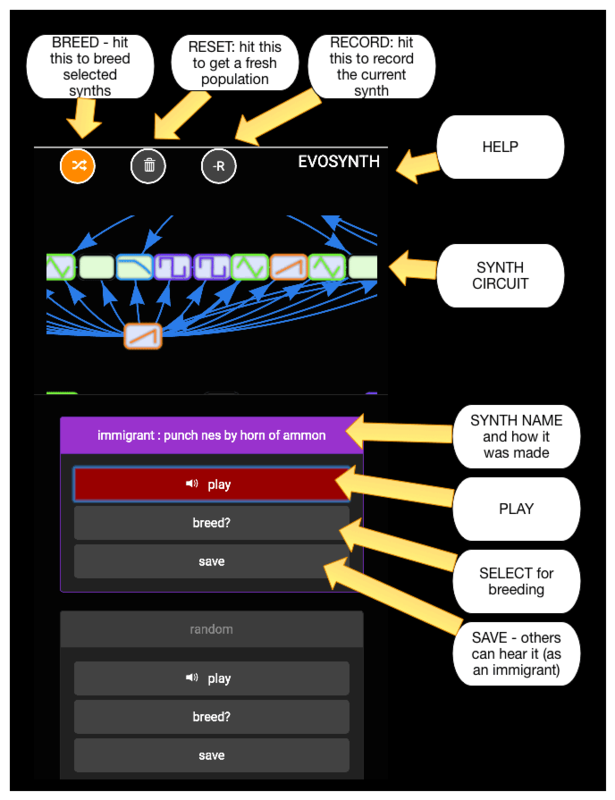 To be more specific, EvoSynth is a sound synthesis system which uses an interactive genetic algorithm to search the space of all possible configurations of a set of oscillators and filters. It is based on an idea I first experimented with back in 2000 with a system I called AudioServe. You can read all about that system here: AudioServe. Press the play buttons below to hear the sounds. If you like a sound, hit breed? to add it to your breeding group. Then hit the breed button at the top to breed your selected sounds. This will generate a new collection of sounds based on the ones you selected. To get a fresh set of random sounds, hit the trash button. at the top. Hit the R to record the current sound. Hit it again and it will start downloading a WAV.